Ambience Congo, which broadcasts every other Sunday out of Richmond Virginia. 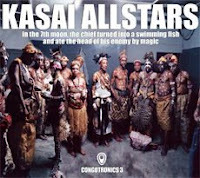 NPR's top ten African albums of the year--headed by the Kasai Allstars. Matsuli music, the place for Juju, dub and afro funk outernational. ndule2kin, showcases Congolese hip-hop artists such as Al Resis. Soukous Radio, the longest-running station playing African and Caribbean music online. Tambour d'Afrique, a weekly radio show entirely devoted to Congolese music on Radio Triomphe in Haiti. Africa Music Treasures, the venerable VOA program. And don't forget about Chopteeth, the groovingest group of mzungus on the east coast.